While it is sometimes called the soft side of change, managing the people side of a change is often the most challenging and critical component of an organizational transformation. Take a merger or acquisition for example. The technical side of the change, or the hard side, if you will, will most certainly be complex. Issues surrounding the financial arrangements of the deal must be worked out. Development will have to take place to integrate the business system. Decisions will be made about the physical arrangements of the newly formed organization. But getting people on board and participating in the change will make the difference. Individuals will have to do their jobs differently, and it is the degree to which they change their behaviors and processes that will make or break the merger or acquisition. The soft side of change is many times actually the harder side of change. 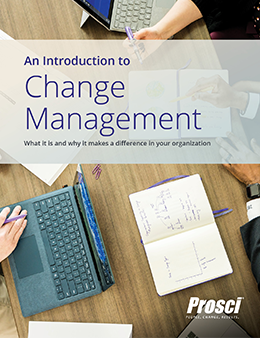 Learn the what, why and how of managing the people side of change with a structured approach to change management. Change management takes care of the people side of change. It does little good to create a new organization, design new work processes or implement new technologies if you leave the people behind. Financial success of these changes will be more dependent on how individuals in the organization embrace the change than how well you draw organization charts or process diagrams. Change management is the process, tools and techniques to manage the people side of change to achieve its required business outcomes. It is the systematic management of employee engagement and adoption when the organization changes how work will be done. Ultimately, change management focuses on how to help employees embrace, adopt and utilize a change in their day-to-day work. Change competency is a leader or manager’s ability to effectively lead their people through change. The notion of a leadership competency is universal, but what that competency entails depends on a person’s relationship to change. For senior leaders, change management competency means being an effective sponsor of change and demonstrating their own as well as the organization’s commitment to the change (read more about the sponsor role and training). For frontline supervisors, competency is related to coaching direct reports through their own change journey (read more about the supervisor role and training). While competency varies depending on one’s relationship to change, organizations are more effective and successful when they build change management competencies throughout their ranks. Change management is not just communication or training. It is not just managing resistance. Effective change management follows a structured process and uses a holistic set of tools to drive successful individual and organizational change. If an individual is missing any of these five building blocks, then the change will not be successful. The goal, then, in leading the people side of change is ensuring that individuals have awareness, desire, knowledge, ability and reinforcement®. Each of the plans has a specific ADKAR element as its focus (read more about the Prosci methodology). Change management practitioners are enablers of these employee-facing roles. And, in times of change, it is the effectiveness of senior leaders as sponsors of change and of managers and supervisors as coaches of change that will determine if a project succeeds or fails. So what can you do to become a more effective change leader? The bottom line is this: begin applying change management on your projects and begin building change management competencies in your organization. These are the first steps to ensuring projects deliver their intended results. The people side of change is not the soft side of change; in reality it is the harder side of change. 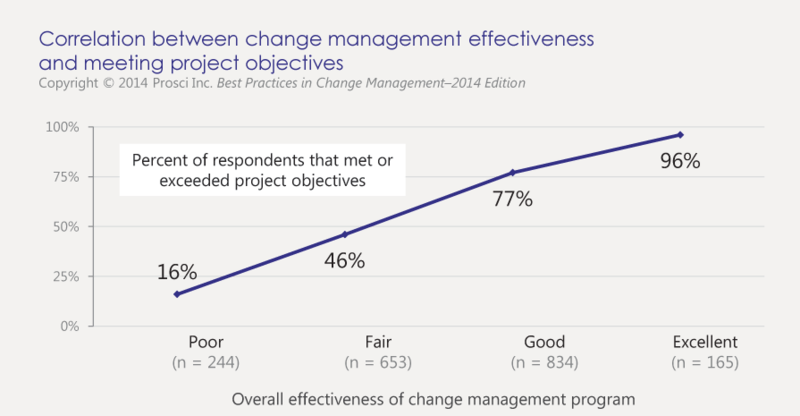 Investing the time and energy to manage the people side of your organizational efforts pays off in the end – in terms of success of the effort and avoidance of the numerous costs that plague poorly managed change.